Product #16396 | SKU PMW300K1 | 0.0 (no ratings yet) Thanks for your rating! The PMW-300K1 XDCAM HD Camcorder from Sony is designed to meet the demands of field video productions and professional studio applications. It is Sony's first semi-shoulder mount camcorder to combine the low-light capabilities of three, 1/2" Exmor Full HD CMOS sensors with the broadcast-quality, Full HD MPEG HD422 codec. The camcorder features the same rugged metal construction, interchangeable EX lens mount, and 14x Fujinon HD lens as the PMW-EX3, but introduces advanced signal processing technology for low-noise and clearer images. The PMW-300K1 also features a 3.5" / 89 mm 960 x 540 LCD viewfinder, built-in ND filters, and 8 assignable function buttons. The camcorder offers two HD/SD-SDI and one HDMI inputs, as well as i.LINK, USB 2.0, timecode, and genlock connections for use with a wide range of AV and IT interfaces. The USB 2.0 port enables the use of the optional CBK-WA100 Wireless Adapter. Included with the camcorder is the Fujinon 14x zoom lens with lens hood and cap, 3.5" / 89 mm LCD viewfinder, BP-U30 battery and charger, infrared remote commander, shoulder strap, cold shoe kit, and a USB cable. The PMW-300K1 captures Full HD 1920 x 1080 video using the broadcast-quality MPEG-2 HD 422 codec at 50 Mbps. It creates industry-standard MXF files. The camcorder can also record Full HD video in MPEG-2 HD 420 at 35 Mbps. For Standard Definition recording, MPEG IMX and DVCAM options are available. 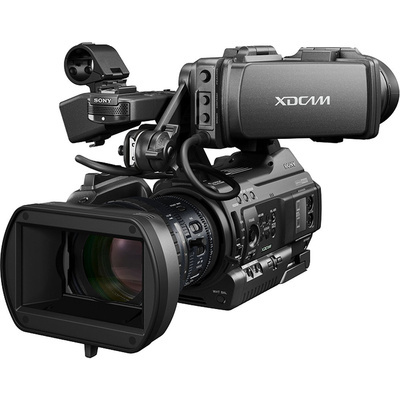 The camcorder is upgradable to support Sony's XAVC codec, when it becomes available. Three, 1/2"-sized Full HD Exmor CMOS sensors provide good low-light performance with low image noise. The camcorder also includes Sony's 3Dimensional Noise Reducer technology (3DNR) to further reduce noise between frames. Featuring the same interchangeable EX-mount system used by the PMW-EX3, the PMW-300K1 is compatible with a wide range of 1/2-inch lenses. The camcorder is also compatible with 2/3-inch lenses using Sony's ACM-21 adapter, sold separately. The PMW-300K1 comes with a Fujinon HD lens with 14x, zoom range with a 35mm equivalent focal length of 31.4 to 439mm. A 3.5" 960 x 540 colour LCD viewfinder enables precision focusing for HD-resolution footage. The viewfinder cover can be flipped up for easier viewing of the LCD screen when the camera is on set or mounted on a tripod. Built-in Neutral Density filters allow you to cut down on the amount of light hitting the camcorder's sensor. This gives you greater iris and depth of field control when shooting in bright/sunny conditions. Neutral Density filters are available in four stages - Clear, 1/4, 1/16, and 1/64. A 15-second cache recording function helps prevent the loss of scenes or events that occur up to 15 seconds before the camcorder's record button is pressed. By pushing the REC button while powering on the camcorder, the 'Quick Rec' mode is activated. This accelerates the start up process and allows the camcorder to start recording more quickly than if powered on normally.